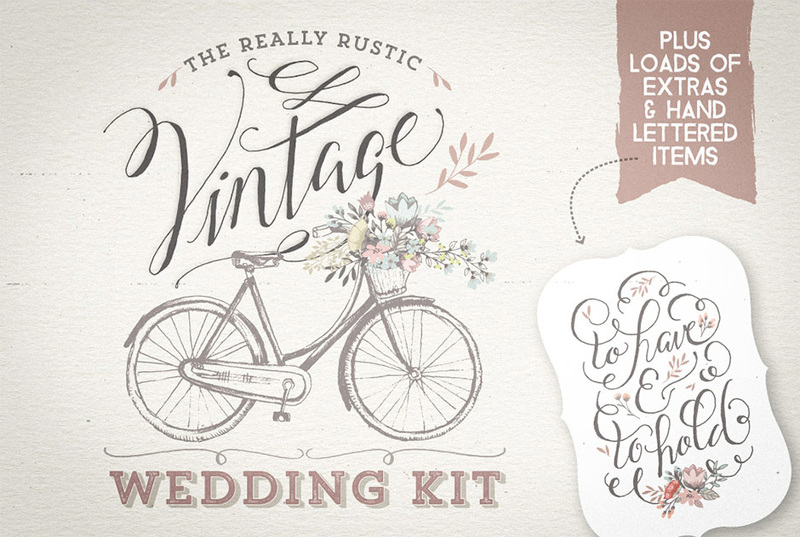 Packed with rustic charm: Introducing The Really Rustic Vintage Wedding Kit! If you’re looking for an authentic, delicate vintage touch to add to your next wedding design then this vintage wedding kit is for you! This set earns the really rustic title because I’ve been careful to retain all the lovely, authentic hand sketched details of the flowers and decorative items. Packed with loads of goodies for you to get stuck into, be sure to click on the preview slides to view the entire set. You’ll receive a wide variety of items to help you whip-up a vintage wedding stationery set in no time: from wreaths (can’t have enough of those! ), bouquets, 3 vintage-inspired objects, loads of hand lettered phrases and words, decorative ornaments, seamless patterns, and a set of floral numbers from 1-20 – perfect for table number place cards! And all the floral elements separately of course. Software requirements: Vector EPS files are compatible with Adobe Illustrator and Photoshop CS2 or newer. File size is approx 330.1MB (516.1MB unzipped), offered as a single download. I completely love this soft. It’s soft and beautiful, just perfect. Thanks for the awesome comment! What amazing feedback and we are so happy you like them!